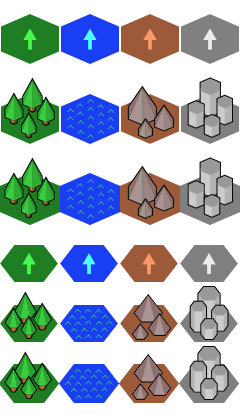 A set of minimalistic hexagonal tilesets for both "pointy top" and "flat top" orientations. We used them to experiment with Tiled's stagger settings. Encoded in the filename is the necessary tile size information. The first block defines the tile size on the grid, the second block defines the tile size in the tileset image. 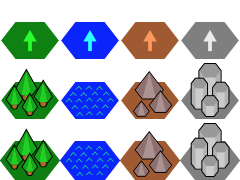 The "pointy top" tileset has a tile size (grid) of 60x52 and individual tiles in the tileset are 60x80 pixels in size. 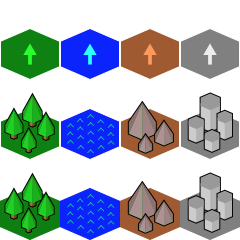 The "flat top" tileset has a tile size (grid) of 60x39 and individual tiles in the tileset are 60x60 pixels in size. If you use Tiled, set the "Hex Side Length" property to half or slightly less than half of the tile width or height (depending on stagger axis).